IM Galyas had a tough battle with GM Nielsen in rd13 of the latest Bundesliga action. Black has been hanging tough in a fierce fight. Now the QBN have a chance to out-duel the QR considering that white’s king is looking a bit loose and the passed c-pawn is a potential powerhouse. What do you suggest for black now? 9…b5 is a dynamic ways to treat the Stonewall Dutch. The plan has been popularized by GM Moskalenko. Black will follow with ..a5 and a general queenside assault on the queenside. In the feature game, IM Galyas plays a model game after some inaccurate white play. Black is a pawn up with a strong outside passed pawn but white is threatening f3 with counterplay against the doubled e-pawns. How should black continue? Hungarian Super-IM Galyas(FIDE high 2487-2010 Fide) used the 3..b6 sideline to duck away from a theory battle. 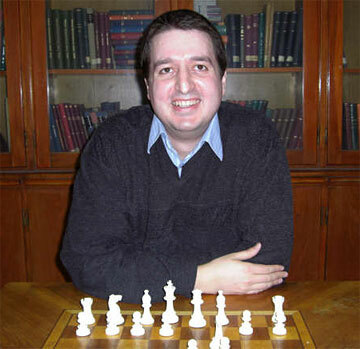 Galyas now has branched into coaching and is a regular contributor to Sakkvilag, the Hungarian chess magazine. Black is on the attack but the breakthrough on the 2nd rank has been stopped. How should black continue now?